British households are overpaying for their energy by around £1.2 billion a year and do not benefit from the best available deals, the Competition and Markets Authority (CMA) revealed as a conclusion to its year-long inquiry into the energy sector. The report found that tariffs offered by the big six energy suppliers were around 5% higher than they should be between 2009 and 2013. It also outlined plans to encourage customers to switch, but stopped short of recommending a break-up of the energy giants, saying competition in wholesale markets was working well. The CMA said it uncovered “widespread consumer disengagement”, with around 70% of customers on default standard variable rate tariffs despite better deals available. More than 34% of 7,000 people polled for an extensive survey have never considered switching, according to the CMA. It found dual fuel customers could save an average of £160 a year by switching to a cheaper tariff but often failed to do so because of a lack of awareness of which deals are available, “confusing and inaccurate” bills and worries over the difficulty of changing supplier. While switching suppliers will certainly help drive down energy bills, implementing an active system that enables home owners to take active control of their heating system is certainly something worth considering. Wireless programmable thermostatic radiator valves offers the best returns in terms of energy efficiency. 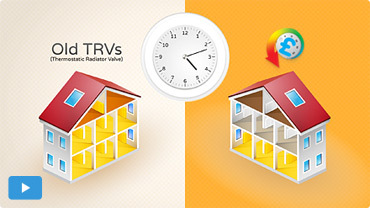 The HeatSave wireless TRVs enable users to set specific functioning times for each valve, and, since radiators are individually controlled, home owners are fully capable to maximise the zoning potential and reduce energy consumption in those areas that are not used for longer periods of time (as for example, dining or sitting rooms and kitchens during the night, etc. ).